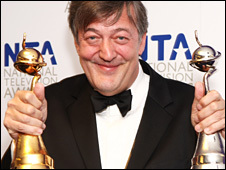 Stephen Fry has celebrated his success at the National Television Awards with a brief return to Twitter. The QI host, one of the most popular celebrities on the micro-blogging site with more than 1.2 million followers, said at the beginning of January that he was quitting in order to write a new autobiography. But he tweeted three times from London's O2 Arena, where he picked up an award for best documentary and the special recognition award. Fry tweeted: "Oh gracious. I'm in a big emotional puddle. Simultaneously as happy as can be but also oddly disposed to burst into tears. I'm an old silly." Earlier, Fry had admitted that he was missing Twitter. "Sort of," he told the BBC. "I used to turn to it almost like the news, it's a weird feeling. I feel quite virtuous, it gives you more hours in the day." Fry published his first autobiography, Moab Is My Washpot in 1997, which covered the first 20 years of his life. He said he there was still "a long way to go" on the new book and he expected to be back on Twitter properly around the end of April. He would be recording a new series of BBC 2 quiz show QI once the book was finished, he added. Asked on the red carpet about programmes like The X Factor and novelty acts like Jedward - who performed at the ceremony, Fry admitted that he didn't watch reality television. "Somebody asked me about Jedward and Vanilla Ice and I thought someone was going to eat an ice cream on stage. I literally have no idea who these people are. I feel like a stranger in my own land sometimes." Fry said he hoped to team up again with his former screen partner Hugh Laurie, now star of US medical drama House. "I've been in Los Angeles writing and I see him rather a lot. I'd hate to think it wouldn't happen again," said Fry. "It's approaching the 30th anniversary of our working together - so we'll be doing a programme about that." Fry also expressed an interest in writing an episode of the new series of Doctor Who, starring Matt Smith. Fry had been in talks with the BBC about writing a David Tennant story in 2005, but the project never materialised.